The touring company of An American in Paris. Photo by Matthew Murphy. A musical and visual feast awaits those attending the national tour of An American in Paris at the Ordway Center for the Performing Arts. The musical is based on the 1951 movie musical of the same name starring Gene Kelly, and played on Broadway in 2015 for an 18-month run. It was nominated for eleven Tony Awards and won four. The show’s songs are classics by Ira and George Gershwin, while the new book is by Craig Lucas. 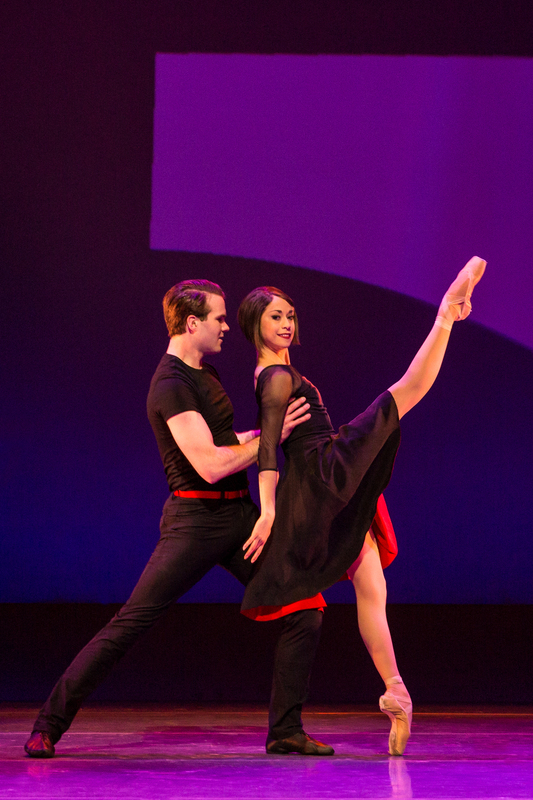 Director and Choreographer Christopher Wheeldon use sets, lighting and dance to provide an excellent showcase for the Gershwins’ lyrics and music. The story centers on Jerry Mulligan (McGee Maddox), an American soldier who remains in Paris after the war to pursue his art. Mulligan is befriended by Adam Hochberg (Etai Benson), another American soldier who is an aspiring composer. A third friend is Parisian Henri Baurel (Nick Spangler), who is from a wealthy textile family but longs to be a nightclub singer in America. Jerry meets and falls in love with Lise Dassin (played on opening night by Sara Esty), a ballerina. Lise, we learn, is engaged to Henri and feels indebted to Henri’s family for their help during the war. Jerry finds a patron in Milo Davenport (Emily Ferranti), a wealthy American woman who seeks a non-platonic relationship with Jerry. Simple enough? Throw in Henri’s parents Madame Baurel (Gayton Scott) and Monsieur Baurel (Don Noble), because things have to get complicated. As with the 1951 movie, the musical exists primarily as a vehicle to showcase classic Gershwin songs and lyrical dance moves. It starts immediately after the end of World War II with a street scene in Paris where those separated by the war reunite. With the orchestra playing Gershwin’s Concerto in F (a follow-up of sorts to Rhapsody in Blue), the impressive choreography of modernistic dance shows the increasing pace as the citizens of Paris are putting the Nazi occupation behind them and are reigniting their city of lights. All of this is done against a very colorful, post-impressionist set of the famed city. Nick Spangler and the touring company of An American in Paris. Photo by Matthew Murphy. Esty does a marvelous job of playing the nervous, uncertain Lise. Maddox seems less comfortable in the role of Jerry, but he has all the right moves as a dancer. When he and Esty dance together it is magical. Benson’s role as narrator for the show is solid, but his role as a would-be suitor for Lise seems tacked on. As Henri, Spangler is very entertaining, especially when he sings and dances his way through “I’ll Build a Stairway to Paradise”, which transforms from a lowly night club act to a full-blown and high-kicking Radio City Music Hall performance. Ferranti succeeds in transforming her role as a wealthy, man-hungry socialite to that of lonely woman with feelings. Scott, as Henri’s mother, plays a stereotypical high society snob, but her comic timely is impeccable and adds greatly to the show’s humor. Set and Costume Designer Bob Crowley’s postmodern, colorful sets showing Paris and the Seine River at night capture the spirit of a reviving Paris. His costumes blend with the music/dance as the stars effortlessly and sometimes continuously change apparel during the dances. What can be better than an evening of Gershwin? An evening of Gershwin interwoven with exquisite dance and imaginative sets. 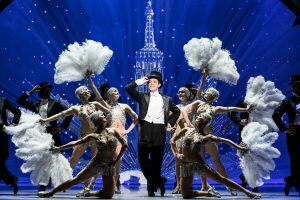 An American in Paris runs through June 18, 2017 at the Ordway Center for the Performing Arts in St. Paul, MN.